Doing good has always been a cornerstone of The Collective business and the brand has recently gone beyond its charitable efforts, delving into the very current issue of sustainability in the grocery industry and its impact on the wider environment. The alarming issue of single-use plastic has been gaining much media attention this year, especially since the airing of Blue Planet, with consumers becoming more and more aware of the issue making changes to their day-to-day purchasing behaviour to lead more sustainable lives. 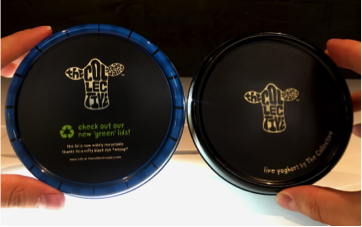 The Collective is well known for its 450g tubs of Gourmet live yoghurt, with their impactful black lids being an iconic part of the brand’s identity since the brand began in 2011. It has recently come to light that the majority of black plastic is not recycled in the UK, as currently in recycling plants, infrared sensors don’t pick up black plastic on the conveyor belts. Determined to find a solution, The Collective’s in-house sustainability team have challenged their packaging suppliers and worked with leading industry experts to build their knowledge of the UK recycling infrastructure and find a way round the issue. The Collective are excited to announce the launch of a first-to-market industry leading technology across the food and drink sector. From October, the lids on The Collective’s 450g and 900g tubs will incorporate a special pigment that makes them detectable across UK recycling plants, meaning consumers can now recycle the black lids with their generic plastic recycling. Amelia Harvey, co-founder at The Collective says “Infrared sensors in recycling plants don’t normally pick up black plastic on conveyor belts. This means our lids are not usually detected, classed as residual waste and incinerated. Now the lids are being made with a new green pigment that can be picked up by plant sensors and will be recycled alongside The Collective’s polypropylene pots. WRAP’s Plastic Specialist Bernard Chase said “WRAP is delighted to have worked with The Collective helping them to implement their first-to-market black pigment technology, leading the way in the grocery sector. In order to help meet the challenging targets set down in the UK Plastics Pact, WRAP hopes that other businesses in the sector may soon follow the lead set by The Collective in adopting this forward-thinking technology”. The Collective’s in-house sustainability team has not only been looking at how to renovate the packaging of its current ranges to improve its recyclability, but sustainability has become an integral part of the innovation, design and NPD process in the business.